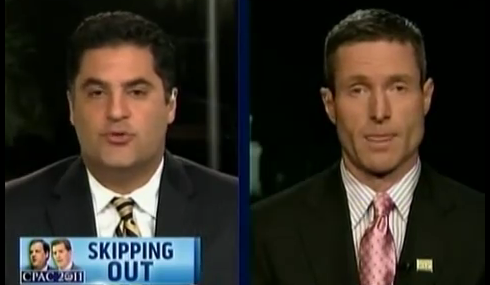 MSNBC’s Cenk Uygur and GOProud’s Christopher Barron are at it again. You may remember Barron from his last time on the tele. He’s the conservative leader of the paradoxical gay, republican organization that has GOP leaders and organizations backing out left and right from the upcoming CPAC convention. Uygur’s (and the rest of the gay community’s) position continues to be – Why the hell are you a Republican? They HATE you. And then Barron is all, “Nuh-uh! Neener neener neener!” Oy. Barron continues to befuddle. He even goes so far as to inadvertently make Uygur’s point for him without realizing it. “It speaks volumes about how little power their message actually has if they are afraid to be in the same room as us…So for the folks who are pulling out about this, it’s for one reason only. It’s because we happen to be gay. That’s it. No policy differences really here.” Yes, we know. That’s what we just said. Is your earpiece not on? This is hardly a debate here. And on policy – Oh really! No policy differences here? None at all? Not DADT Repeal? Not enactment of the Employment Non-Discrimination Act? Or the repeal of the Defense of Marriage Act? Not marriage equality? Not half price drinks during the State of the Union address? No policy differences at all, eh? The Republican Party and America’s gays are in complete and total synchronistic agreement on those issues, are they? I see. Any gay Republicans in our herd? Tell me Why-ee.